Uber Technologies Inc Chief Executive Officer Travis Kalanick told employees on Tuesday he will take time away from the company he helped to found, one of a series of measures the ride-hailing company is taking to claw its way out from under a mountain of controversies. Kalanick's move comes after a months-long investigation led former U.S. Attorney General Eric Holder, who was hired by Uber to look into its culture and workplace practices after a female former employee publicly accused the company of what she described as brazen sexual harassment. 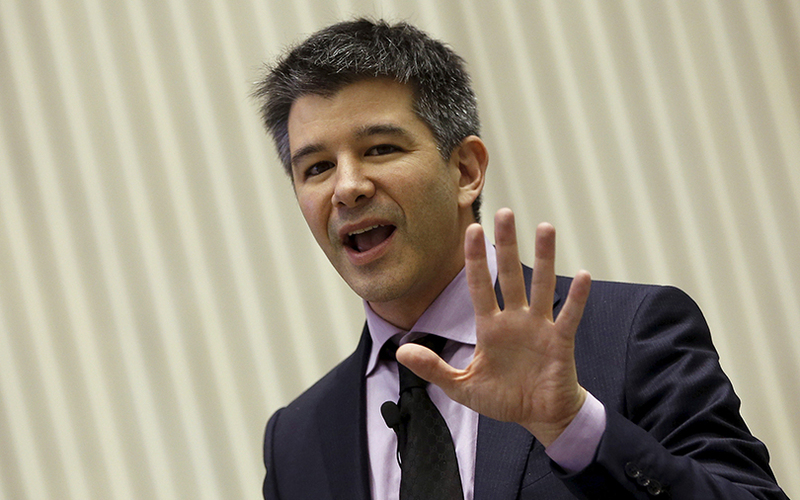 Uber on Tuesday released the recommendations from that report, which include reducing Kalanick's sweeping authority and instituting more controls over spending, human resources and the behavior of managers. Kalanick's departure, even if it is temporary, is a thunderclap for the Silicon Valley startup world, where company founders in recent years have enjoyed great autonomy and often become synonymous with their firms. It also marks a pivotal moment for the world's most valuable venture-backed private company, which has been largely defined by Kalanick's brash approach. "If we are going to work on Uber 2.0, I also need to work on Travis 2.0 to become the leader that this company needs and that you deserve," Kalanick wrote in his email. "During this interim period, the leadership team, my directs, will be running the company." The meeting was marred by private equity executive David Bonderman making a sexist remark about women talking too much. He later resigned from the board of directors, calling his comment "careless, inappropriate, and inexcusable." The recommendations from Holder's firm, Covington and Burling, include adding an independent director to the board and considering an independent chair; mandated manager training; and a bigger and more independent audit committee to oversee spending and management. "I would now suggest to any startup, here are the Covington rules, and when you get passed 100 people, put these in place," said Steve Blank, a startup founder and mentor and adjunct professor at Stanford University. "I think it paints a picture of a company pretty out of control with no oversight from the board or basic controls," said Elizabeth Ames, senior vice president at the Anita Borg Institute, which advocates for women in technology. At Tuesday's employee meeting, human resources chief Liane Hornsey thanked the former employee who wrote about harassment, Susan Fowler, for being a catalyst for the changes. She received applause from employees, according to the source at the meeting. Holder's recommendations stressed the importance of a new chief operating officer. The company has been searching for a No.2 executive for more than three months and is also looking for a chief financial officer. The most recent departing executives included Emil Michael, head of business and Kalanick's closest confidant, and Eric Alexander, who ran the Asia Pacific region. Uber said last week it had hired two women to fill top roles: Harvard Business School management professor Frances Frei will serve as an executive coach and Apple Inc marketing executive Bozoma Saint John was hired to mend Uber's brand. Uber also added a second woman to its board, Wan Ling Martello, an executive vice president at Nestle, to serve as an independent director. Uber has suffered a series of damaging setbacks in recent months, including a federal probe into the company's use of technology to evade regulators in certain cities and a trade secrets lawsuit filed by Alphabet Inc's self-driving unit, Waymo. Some venture capitalists say Uber's challenges should serve as a warning that the Silicon Valley ethos of leaving founders in control of companies, even after they grow into big corporations, can be a dangerous proposition. "Inevitably, this will help drive the pendulum back toward better governance inside an organization," said Robert Siegel, a lecturer at Stanford University and venture capitalist at XSeed Capital. "Sometimes we conflate great business leaders with strong personalities with great governance."